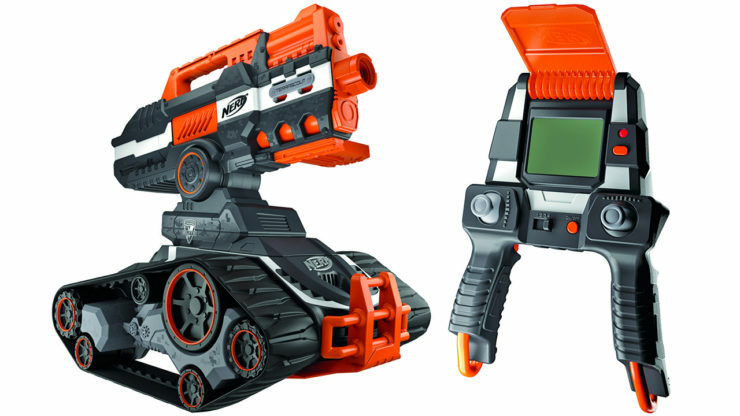 Nerf N-Strike Elite Terrascout Drone Blaster Ups The Cubicle Wars Ante | OhGizmo! By David Ponce on 06/06/16 • Leave a comment! You may think Nerf toys are for kids, but then you’d be ignoring the hordes of bored cubicle dwellers who ‘increase their productivity’ by partaking in the occasional bout of friendly office warfare. If you’re lucky enough to work in such an environment (or if you’re actually a kid), you’ll love the Nerf N-Strike Elite Terrascout Drone Blaster. It’s a remote controlled tank that fires up to 18 darts per load, but more importantly, it’s also a tank that sends a live-feed of what’s in front of it to its remote control. This way you don’t have to have line-of-sight on your machine, making it possible to annihilate your enemies from the safety of whatever hiding place you pick. You’ll even be able to take 720p still shots, so you can record the horrified faces of your foes as they realize they’re about to get shot. It’s $200 and available this fall. Also if you do have kids, maybe keep them off the Internet for a year or so… or prepare to punch a $200 hole in your wallet.